My micro-autobiography gives some more clues as to how I ended up here. However, if you want change then you have to make use the tools available and in a democracy that means getting elected which implies taking a political stance. The Political Compass is a valuable resource for exploring the range and variety of political views. The usual political right/left classification, which is really a measure from an economic perspective, is extended into another dimension to measure from the social perspective ranging from authoritarian to libertarian. See how UK political parties fit onto this map in 2015; you can find out where you sit by taking the test . 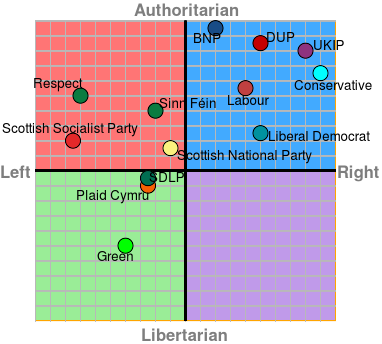 I am in the middle of the green quadrant, which is handy, being as I stood as a Green candidate. Most parish and town councillors put their names forward for election because they genuinely want to make their communities better and I know some excellent committed councillors from across the whole political spectrum. However, I also know a few who just wanted the kudos or thought they could better themselves or were 'put up to it' to vote in support of their friends, a particular problem with some large political parties. My experience, looking from the bottom of the political heap, is that as the political position becomes more powerful there is a significantly higher proportion of 'bad apples' and dubious activity. If you don't believe me, search out the proportion of MPs with a criminal record or those accused of fraud or financial impropriety. Recall, that about half of them repaid money following the parliamentary expenses scandal . The climate change argument is one which can expose problems. Atmospheric CO2 is increasing due to man-made activity and the additional CO2 is having a detrimental effect on climate stability. It will not destroy everything, but it will make the world a very difficult place for some people to live. There will always be some people who have a problem my statement. Perhaps they don't believe scientific evidence or prefer to follow some faith based explanation or maybe they just don't care. I have heard so many bad arguments from a small but very vocal minority of 'climate change deniers' but when challenged end up with some form of 'yeah, well that's what I believe' expressed as if belief equals truth. Biased people are inclined (or prejudice) to find in favour of one view despite having little evidence or not having fairly assessed any alternative views. Just because someone holds strong views does not imply bias. While everyone is entitled to an opinion, not all opinion is equal. Some opinion is totally worthless and may be disregarded while other is extremely valuable, but it sometimes takes some effort to establish the true value of someone's opinion. Quality opinion will be formed from study, research and understanding. Possibly the most dangerous issue is one of hidden interst. People lead complicated lives and having connections with other people or businesses is common, but it is important to be open and clear about these connections. This is why all Council meetings start with an agenda item "declarations of interest". If an interest could be perceived as being prejudicial it is best to step aside of the actual decision making. While no one can be completely immune from opinion and bias, the negative aspects of such can be minimised by measurement, science and peer review. My original statement has been demonstrated to a high confidence level by people devoting their lives to understanding the subject and therefore these people have extremely valuable opinions.